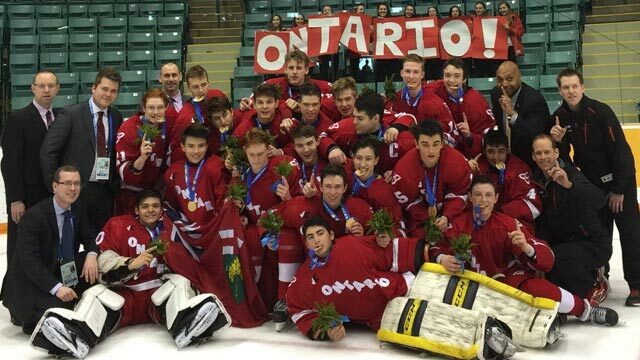 Held every four years, the Canada Winter Games are a showcase of the best under-16 players in the country, representing their home province. Men’s hockey debuted at the inaugural Canada Games in 1967, with the University of Alberta Golden Bears beating the UBC Thunderbirds to win the first gold medal. The tournament replaced the World Under-17 Hockey Challenge every four years through the 1990s and 2000s, before it became a U16 event beginning with the 2011 Games. Ontario (5G 2S 2B) and Alberta (4G 4S 3B) have owned the top of the podium, combining for nine of the 13 gold medals, and seven different provinces have earned at least one medal. The star-studded alumni list is headed by Sidney Crosby, who wore the ‘C’ for Nova Scotia in 2003 and led the tournament in scoring, while nine members of Ontario’s gold-medal-winning entry from 2007 have seen NHL action (Cuma, Cundari, Del Zotto, Della Rovere, Henrique, Hodgson, Kadri, Pietrangelo, Stamkos). 2019 Quebec Ontario Alberta Red Deer, Alta. 2015 Ontario Alberta Manitoba Prince George, B.C. 2011 British Columbia Quebec Alberta Halifax, N.S. 2003 Alberta Quebec Ontario Bathurst, N.B. 1999 Alberta Quebec British Columbia Corner Brook, N.L. 1995 Saskatchewan Alberta Quebec Grande Prarie, Alta. 1991 Ontario Alberta Manitoba Charlottetown, P.E.I. 1987 Quebec Ontario British Columbia Cape Breton, N.S. 1983 Ontario British Columbia Quebec Saguenay, Que. 1979 British Columbia Nova Scotia Quebec McCreary, Man. 1975 Alberta Nova Scotia Quebec Lethbridge, Alta. 1971 Ontario Alberta Quebec Saskatoon, Sask. 1967 Alberta British Columbia Ontario Quebec City, Que.